The Sea Cliff Bridge is a balanced cantilever bridge located in the northern Illawarra region of New South Wales, Australia. 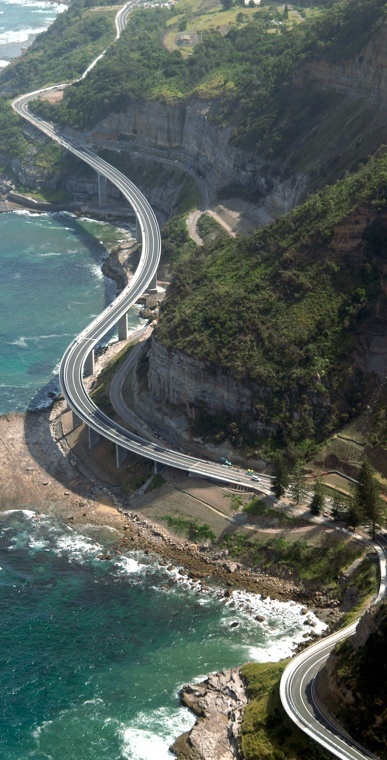 The $52 million bridge links the coastal villages of Coalcliff and Clifton. Featuring two lanes of traffic, a cycleway and a walkway, the Sea Cliff Bridge boasts spectacular views and is a feature of the scenic Lawrence Hargrave Drive. The Sea Cliff Bridge replaced a section of Lawrence Hargrave Drive that was permanently closed in August 2003 due to regular rock falls. A public outcry emerged over the road closure as Lawrence Hargrave Drive is the only road directly linking Coalcliff, Stanwell Park, Otford and Helensburgh to the northern suburbs of Wollongong. The bridge was officially opened by NSW Premier Morris Iemma at a 'ribbon cutting' ceremony on 11 December 2005, and has met with great public approval and increased business for the area's tourism industry.